The deal covers many things including Cheadle Lake and the embankment, now paved, alongside the canal. The long-running dispute between Albany and Lebanon over the Santiam Canal is about to be settled, and the public works staffs and lawyers of both cities deserve the credit for working out the details. The draft of a new agreement covering the 18-mile canal goes to the Albany and Lebanon city councils Wednesday night (Feb.24). Both councils reviewed the major points in executive sessions earlier and, apparently, raised no objections. Formal ratification, though, is not expected until later when technical exhibits are completed. The canal delivers water to both Lebanon and Albany from an intake six miles upstream from Lebanon on the South Santiam River. Albany acquired the canal and related facilities from Pacific Power & Light in 1984, and the two cities made an agreement on sharing future costs. But its provisions were neither clear nor strictly carried out, and in recent years Albany started making demands that Lebanon considered unfair. At one time over the last year or so, the dispute almost got out of hand as the cities traded threats of legal action. But then common sense took hold. In the new agreement, Albany drops its demand that Lebanon pay millions dollars as its share of head gate improvements Albany had installed a decade ago. Instead, Lebanon agrees to pay Albany $900,000 in installments over the next four years, and Albany will use the money for work in Lebanon to deal with storm runoff. The projects include work on what’s known as the Crown Zellerbach gates and the Marks Slough weir. 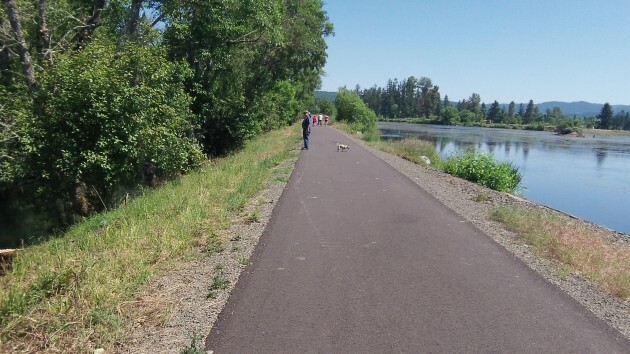 The idea is that in big storms, water draining into the canal from a section of Lebanon can be diverted down the slough toward the South Santiam River, thus keeping it from causing flooding lower along the canal. In addition, Lebanon is to improve facilities used to drain Lebanon’s Cheadle Lake, adjacent to the canal, a job that’s estimated to cost Lebanon about $100,000. Also, both cities will cooperate on a plan to safeguard the embankment between Cheadle Lake and the canal. The deal also includes a separate agreement on water delivery. Lebanon will pay Albany $77,000 for water this budget year and $133,000 annually in subsequent fiscal years until it no longer needs the canal. Lebanon is working to develop its own, separate source of water on the South Santiam, and that’s expected to be accomplished in two or three years. It’s an uncertain thing when neighbors throw lawyers. Sounds as though Staff brought enough facts forward that the two executive groups could find a reasonable compromise. Amazing what real communication can do.